It all got away from you, didn’t it. Life happened. Life was a mess. You were a mess. Here is not heaven, that’s for sure. It all fell apart. Maybe you fell apart. How to put yourself back together? Fast, before they even notice? I’ll show you how. Here are 6 precise, proven and powerful tips… and that’s just for Day #1! Get on the bathroom scale. “All progress starts with telling yourself the truth”. Get out your fitness app. Start typing. Track every bite you eat today. Get to the gym (if you can). Get rid of oppressive cravings by fasting a meal today. Do it! Get out of your own way. 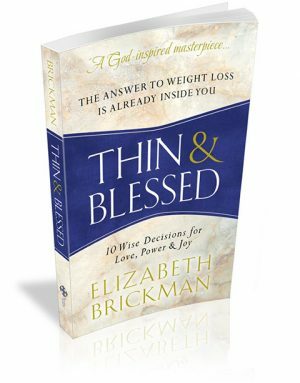 Quickly review the 10 Wise Decisions of THIN & BLESSED. You’ll instantly spot the saboteur hiding inside your head, lying to you, distorting your relationship with food, with God and with yourself. You’ll be shown exactly what to do. The saboteur will be shown the door! Get over it. Recitals of angst, remorse and defeat benefit only the enemy. They do nothing for you. Nothing! So, don’t get sad. Get smart. Get strategic. Get going. Tune in… The return to thin will be quicker for you than you think!